There are several ways to express this using C++ – there is nice presentation here: slides . Another implementation could be found on github – link. And to finish the list there is nice post at Bartosz’s programming cafe – link. Here is my draft implementation and couple of examples. This structure represents some event which has a name, rating, some schedule of time intervals and some integer tags. Let’s start with trivial lens created manually – accessor for title field of event. Note: we even created object after the lens. So all lens-constructors for basic fields (in current example: isPublic, title, rating, start, finish, etc) are generated automatically. 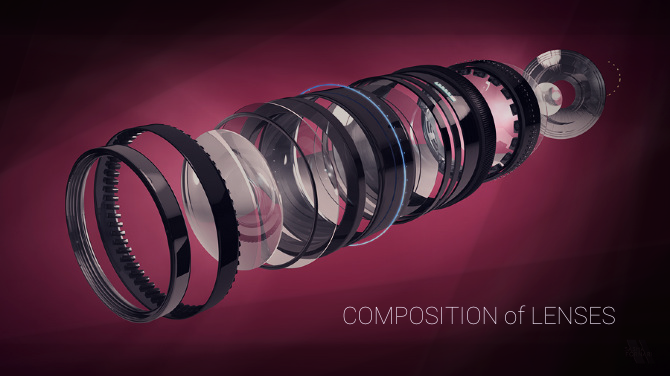 Ok, now main magic – composition of lenses. To make such composition we could make special function (call it zoom for example), or we could use infix operator like the one inside slides. Or we could just use piping again to compose things (post about piping) – so we only need to overload “|” operator. I used functional syntax here, but it could be easily rewritten using any regular syntax as you might guess. So consider it as just as example how it might look. We form final lens in one line and then apply it to correct schedule item with id = 1. This could be extended to any kind of complex nested immutable structures. Also you could create any custom lenses as we did to access vector element. It could even have some inner state. 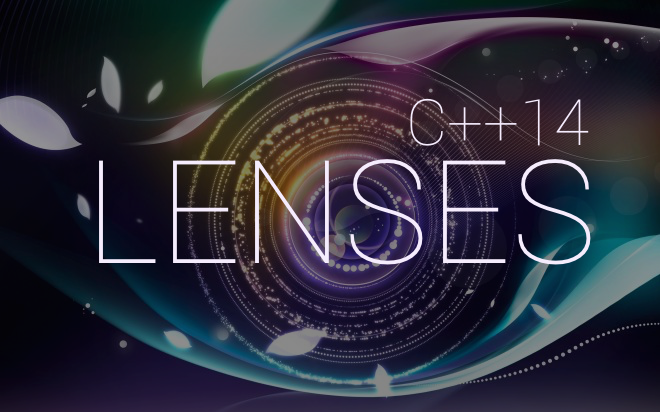 Any way – lenses are brilliant way to modify parts of serious immutable data. There is one minor problem which you probably had experienced when tried to make some photos – sometimes you can’t get object part into focus. The same thing will happen if in previous example you will try to modify schedule item using wrong id. If such id does not exists inside schedule whole chain of lenses will crash. Let’s invent some protection for such case. Modern camera will not shoot if autofocus system is not locked on something – so let’s add method bool hasFocus(…) to lens. I added this as third must-have parameter to lens constructor but there are probably many other ways. Here we tried to focus on element with id 10, which was not in the list. If we provide other object which contains such schedule item – the lens will get focus. This is nice way to avoid a lot of nullptr checks in real cases. Focus check could be also implemented through some monadic execution of such chain, but this is another topic. Instead of providing a variable to lens constructor we could use a function as predicate parameter. This functional parameter even could be a mutable function or some external dependence. Method hasFocus here could still be used to get rid of nullptr checks and in some cases this could be used as solution to replace MayBe monad (for a price – we need to traverse the chain twice). Also we could extend lens with additional parameters in both get/set methods and constructors and get more complex designs. Lenses are nice way to write access/modifications of complex structures. They have a lot of flexibility to tune. Auto generation of lens-constructors for basic immutable fields could save a lot of time. Separation of accessors / modifiers / data is a way to simplicity. Functional pipelines are suitable way to construct composition of lenses. Additional method to check focus could replace nullptr checks. Introducing functional parameters to lens constructors gives additional flexibility.